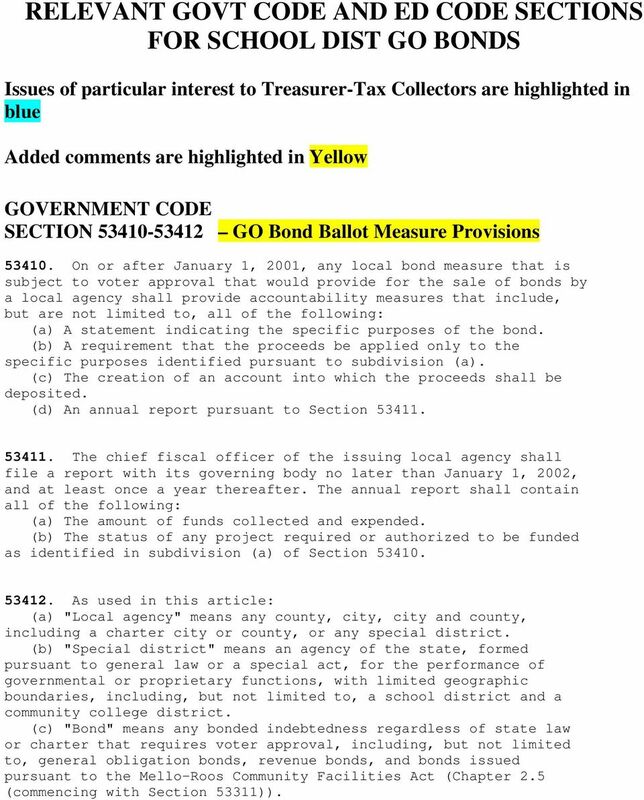 Download "RELEVANT GOVT CODE AND ED CODE SECTIONS FOR SCHOOL DIST GO BONDS"
1 RELEVANT GOVT CODE AND ED CODE SECTIONS FOR SCHOOL DIST GO BONDS Issues of particular interest to Treasurer-Tax Collectors are highlighted in blue Added comments are highlighted in Yellow GOVERNMENT CODE SECTION GO Bond Ballot Measure Provisions On or after January 1, 2001, any local bond measure that is subject to voter approval that would provide for the sale of bonds by a local agency shall provide accountability measures that include, but are not limited to, all of the following: (a) A statement indicating the specific purposes of the bond. (b) A requirement that the proceeds be applied only to the specific purposes identified pursuant to subdivision (a). (c) The creation of an account into which the proceeds shall be deposited. (d) An annual report pursuant to Section The chief fiscal officer of the issuing local agency shall file a report with its governing body no later than January 1, 2002, and at least once a year thereafter. The annual report shall contain all of the following: (a) The amount of funds collected and expended. (b) The status of any project required or authorized to be funded as identified in subdivision (a) of Section As used in this article: (a) "Local agency" means any county, city, city and county, including a charter city or county, or any special district. (b) "Special district" means an agency of the state, formed pursuant to general law or a special act, for the performance of governmental or proprietary functions, with limited geographic boundaries, including, but not limited to, a school district and a community college district. 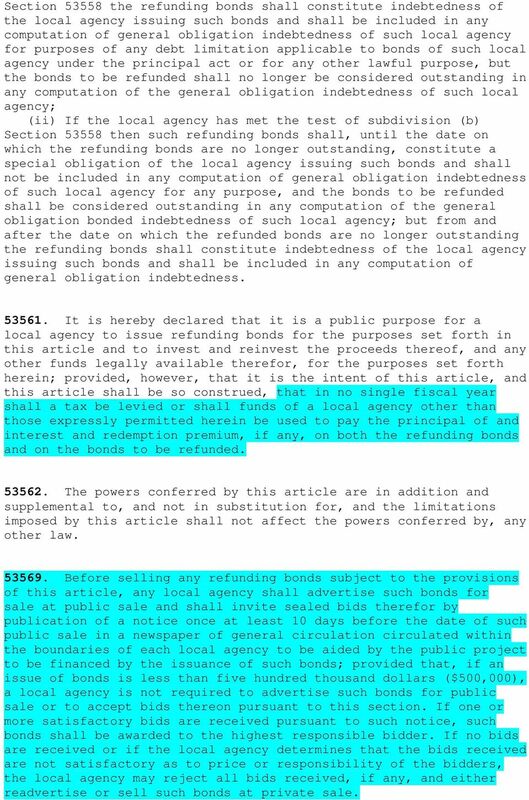 (c) "Bond" means any bonded indebtedness regardless of state law or charter that requires voter approval, including, but not limited to, general obligation bonds, revenue bonds, and bonds issued pursuant to the Mello-Roos Community Facilities Act (Chapter 2.5 (commencing with Section 53311)). 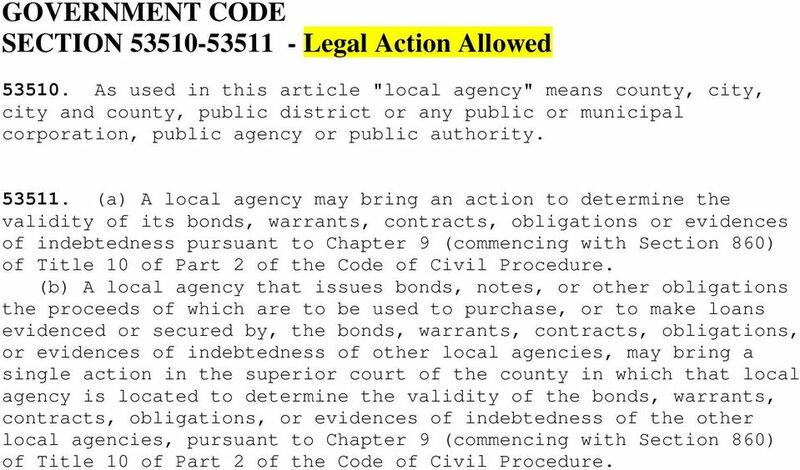 2 GOVERNMENT CODE SECTION GO Bond Issuance General Provisions As used in this article: (a) "Local agency" means county, city, city and county, public district, or other public or municipal corporation. (b) "General obligation bonds" means bonds, warrants, notes or other evidence of indebtedness of a local agency payable, both principal and interest, from the proceeds of ad valorem taxes or ad valorem assessments which may be levied without limitation as to rate or amount upon property in the local agency subject to taxation or assessment. (c) "Legislative body" means the legislative body of the local agency as defined in Section (d) "Revenue-producing facility" means an improvement, works, system or facility furnishing or providing services or products for which the local agency is authorized to impose a charge. (e) "Pledge" means pledge, assign, place a charge upon and place a lien upon This article applies to all local agencies which have the power to issue general obligation bonds to acquire, construct or finance a revenue-producing facility In any ordinance, resolution, order or indenture providing for the issuance of general obligation bonds of a local agency to provide funds for the acquisition, construction or financing of a revenue producing facility or any addition to, or extension or improvement of a revenue-producing facility, the legislative body of the local agency may pledge all or any part of the revenues of such facility to the payment or security of such general obligation bonds and the interest thereon in such manner and upon such terms as the legislative body may deem advisable In connection with such pledge the legislative body may provide in such ordinance, resolution, order or indenture such covenants, promises, restrictions and provisions as it may deem necessary or desirable including, but not limited to, covenants, promises, restrictions and provisions relating to the use of bond proceeds, the maintenance, operation and preservation of such facility, the rates and charges to be established and collected for the services or products furnished or provided by such facility, the incurring of additional indebtedness payable from such revenues, and the establishment, maintenance and use of reserve funds, sinking funds, interest and redemption funds, maintenance and operation funds and other special funds for the payment or security of the bonds and the interest thereon. In connection with such pledge and in connection with such covenants, promises, restrictions and provisions the legislative body shall have, but shall not be limited to, the powers specified in the Revenue Bond Law of 1941 (Chapter 6 of this part). 3 The pledge and the payment and security provisions authorized by this article shall be in addition to, and not in derogation of, any provisions permitted or required by law, charter or the Constitution of the State of California relating to payment of general obligation bonds from the proceeds of ad valorem taxes or ad valorem assessments and relating to the levy and collection of such taxes or assessments If the legislative body intends to exercise the powers granted by this article it shall make a statement of such intention in any ordinance, resolution or order calling or providing for an election to authorize the general obligation bonds for a revenue producing facility. Such statement may be general only or it may give such detail as the legislative body may deem proper. If any such statement is made, the ordinance, resolution, order or indenture providing for the issuance of such bonds shall be substantially in accord with such statement. 6 (1) "Legislative body" means the governing body of a local agency. 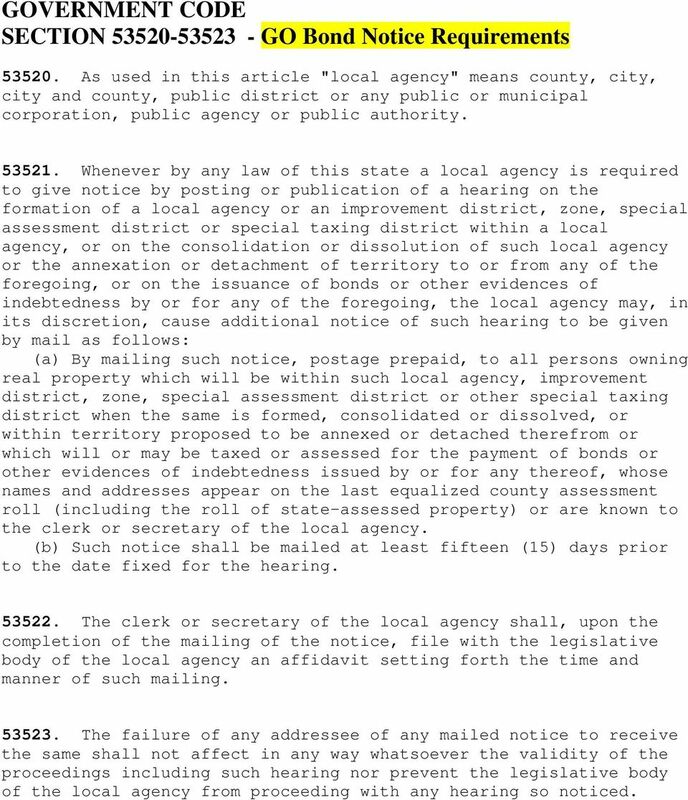 (2) "Local agency" means a city, county, city and county, and special district. "Special district" means an agency of the state formed for the performance of governmental or proprietary functions within limited geographic boundaries, and shall not include a school district or community college district. 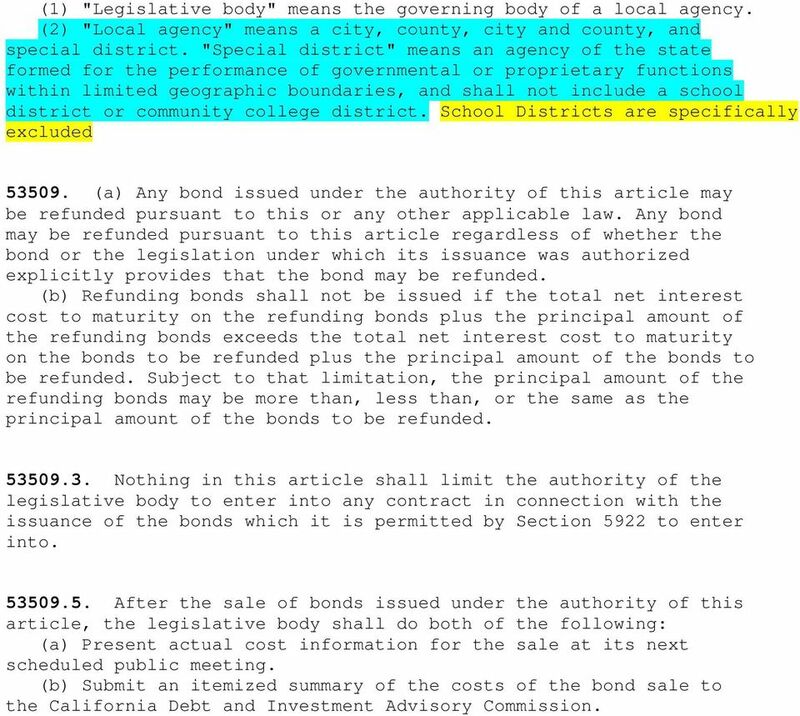 School Districts are specifically excluded (a) Any bond issued under the authority of this article may be refunded pursuant to this or any other applicable law. Any bond may be refunded pursuant to this article regardless of whether the bond or the legislation under which its issuance was authorized explicitly provides that the bond may be refunded. (b) Refunding bonds shall not be issued if the total net interest cost to maturity on the refunding bonds plus the principal amount of the refunding bonds exceeds the total net interest cost to maturity on the bonds to be refunded plus the principal amount of the bonds to be refunded. 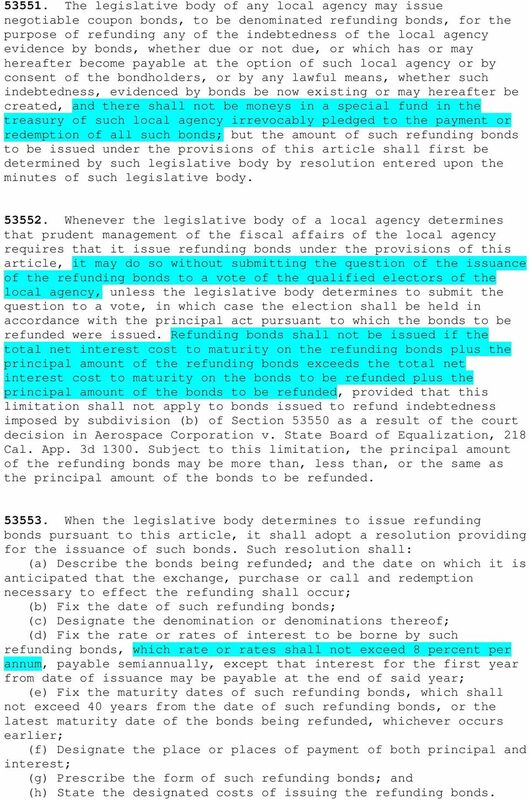 Subject to that limitation, the principal amount of the refunding bonds may be more than, less than, or the same as the principal amount of the bonds to be refunded Nothing in this article shall limit the authority of the legislative body to enter into any contract in connection with the issuance of the bonds which it is permitted by Section 5922 to enter into After the sale of bonds issued under the authority of this article, the legislative body shall do both of the following: (a) Present actual cost information for the sale at its next scheduled public meeting. (b) Submit an itemized summary of the costs of the bond sale to the California Debt and Investment Advisory Commission. 7 GOVERNMENT CODE SECTION Legal Action Allowed As used in this article "local agency" means county, city, city and county, public district or any public or municipal corporation, public agency or public authority (a) A local agency may bring an action to determine the validity of its bonds, warrants, contracts, obligations or evidences of indebtedness pursuant to Chapter 9 (commencing with Section 860) of Title 10 of Part 2 of the Code of Civil Procedure. (b) A local agency that issues bonds, notes, or other obligations the proceeds of which are to be used to purchase, or to make loans evidenced or secured by, the bonds, warrants, contracts, obligations, or evidences of indebtedness of other local agencies, may bring a single action in the superior court of the county in which that local agency is located to determine the validity of the bonds, warrants, contracts, obligations, or evidences of indebtedness of the other local agencies, pursuant to Chapter 9 (commencing with Section 860) of Title 10 of Part 2 of the Code of Civil Procedure. 8 GOVERNMENT CODE SECTION GO Bond Notice Requirements As used in this article "local agency" means county, city, city and county, public district or any public or municipal corporation, public agency or public authority Whenever by any law of this state a local agency is required to give notice by posting or publication of a hearing on the formation of a local agency or an improvement district, zone, special assessment district or special taxing district within a local agency, or on the consolidation or dissolution of such local agency or the annexation or detachment of territory to or from any of the foregoing, or on the issuance of bonds or other evidences of indebtedness by or for any of the foregoing, the local agency may, in its discretion, cause additional notice of such hearing to be given by mail as follows: (a) By mailing such notice, postage prepaid, to all persons owning real property which will be within such local agency, improvement district, zone, special assessment district or other special taxing district when the same is formed, consolidated or dissolved, or within territory proposed to be annexed or detached therefrom or which will or may be taxed or assessed for the payment of bonds or other evidences of indebtedness issued by or for any thereof, whose names and addresses appear on the last equalized county assessment roll (including the roll of state-assessed property) or are known to the clerk or secretary of the local agency. (b) Such notice shall be mailed at least fifteen (15) days prior to the date fixed for the hearing The clerk or secretary of the local agency shall, upon the completion of the mailing of the notice, file with the legislative body of the local agency an affidavit setting forth the time and manner of such mailing The failure of any addressee of any mailed notice to receive the same shall not affect in any way whatsoever the validity of the proceedings including such hearing nor prevent the legislative body of the local agency from proceeding with any hearing so noticed. 10 year, payable as permitted by law, according to standard tables of bond values Notwithstanding Section or any other provision of law establishing limitations on the rate of interest of any indebtedness or obligation of a city, county, or city and county the rate of interest on any indebtedness or obligation thereof which is payable to the federal government or any agency or instrumentality thereof or any indebtedness or obligation guaranteed by the federal government or any instrumentality thereof may be at a rate higher than the limitations established in any other law if such rate is the rate established by the federal government or any instrumentality thereof. Any such indebtedness or obligation shall be in such form and denomination, have such maturity, and be subject to such conditions as may be prescribed by the federal government or agency or instrumentality thereof Any provision of law to the contrary notwithstanding, a city, county, or city and county may enter into contracts commonly known as "interest rate swap agreements" or "forward payment conversion agreements" with any person providing for the exchange of payments between the person and the city, county, or city and county, including, without limitation, contracts providing for the exchange of fixed interest payments for floating payments or floating interest payments for fixed payments, or a combination thereof. The contracts may be made upon the terms and conditions established by the legislative body of the city, county, or city and county. The authority conferred by this section includes the authority to enter into any and all contracts incident to the exercise of the authority conferred by this section including, without limitation, contracts to obtain credit enhancement devices and contracts for the performance of professional services. 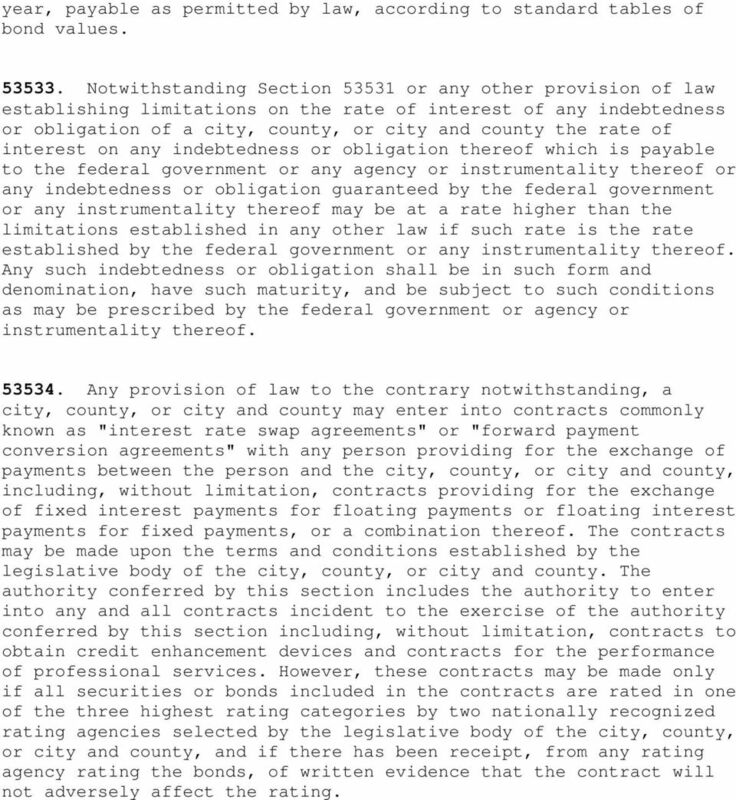 However, these contracts may be made only if all securities or bonds included in the contracts are rated in one of the three highest rating categories by two nationally recognized rating agencies selected by the legislative body of the city, county, or city and county, and if there has been receipt, from any rating agency rating the bonds, of written evidence that the contract will not adversely affect the rating. 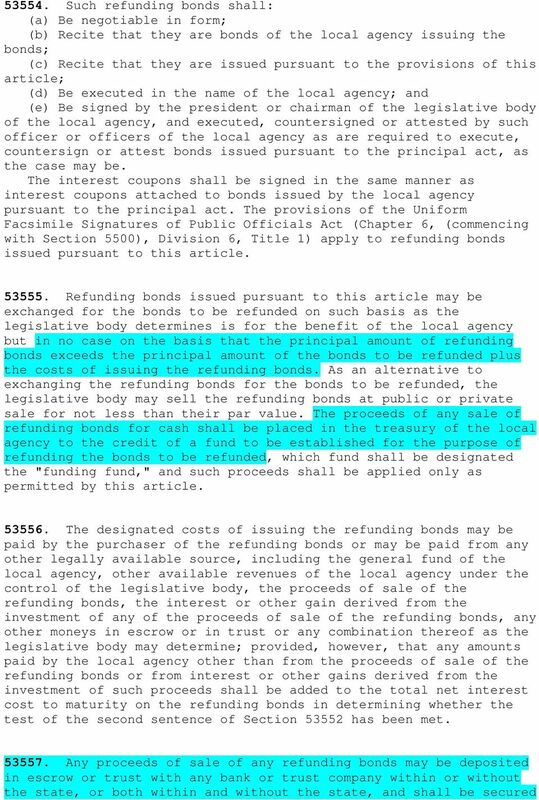 11 GOVERNMENT CODE SECTION GO Bond Refunding The following terms shall have the following meanings: (a) "Local agency" means public district, public corporation, authority, agency, board, commission, county, city and county, city, school district, or other public entity. 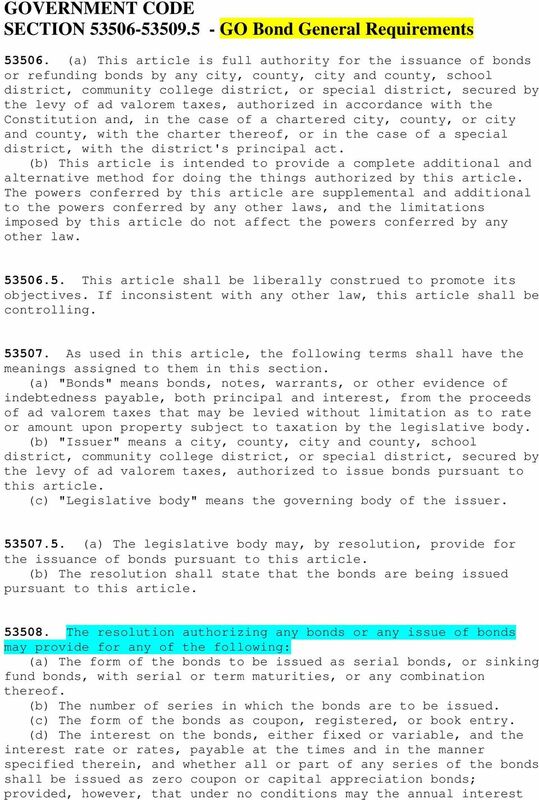 (b) "Bonds" means bonds, warrants, notes or other evidence of indebtedness of a local agency or any improvement district or zone thereof payable, both principal and interest, from the proceeds of ad valorem taxes or ad valorem assessments which may be levied without limitation as to rate or amount upon property in the local agency or any improvement district or zone thereof subject to taxation or assessment, or any outstanding indebtedness payable to the State Board of Equalization as repayment of the local agency's share of refunds made as a result of the California Court of Appeal decision in Aerospace Corporation v. State Board of Equalization, 218 Cal. App. 3d 1300, which indebtedness is hereby imposed on all the local agencies that are required to participate in the refund obligations arising from this decision and that are declared and determined to have been imposed by law. (c) "Legislative body" means the board of directors or other governing body of the local agency, unless the context otherwise requires. (d) "Principal act" means the law under which bonds to be refunded were issued. 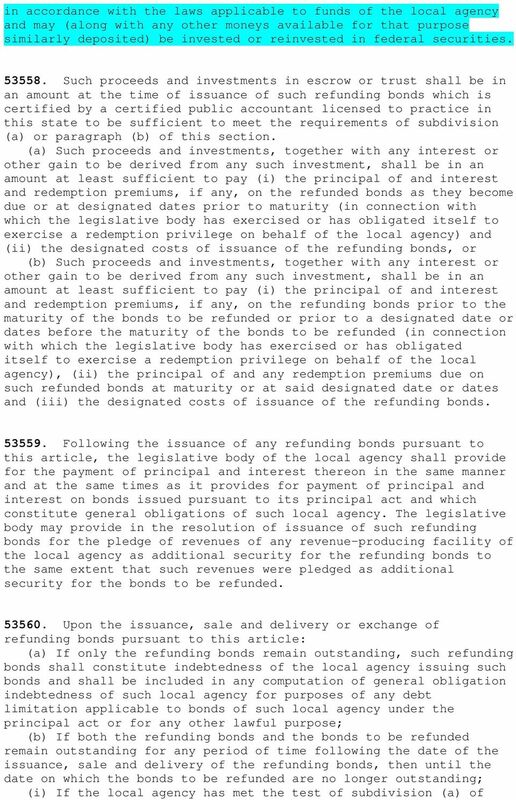 (e) "Costs of issuing the refunding bonds" means those of the following costs and expenses designated by the legislative body in the resolution providing for the issuance of the bonds: (1) All expenses incident to the calling, retiring or paying of the bonds to be refunded and to the issuance of refunding bonds, including the charges of any escrow agent or trustee in connection with the issuance of the refunding bonds or in connection with the redemption or retirement of the bonds to be refunded. 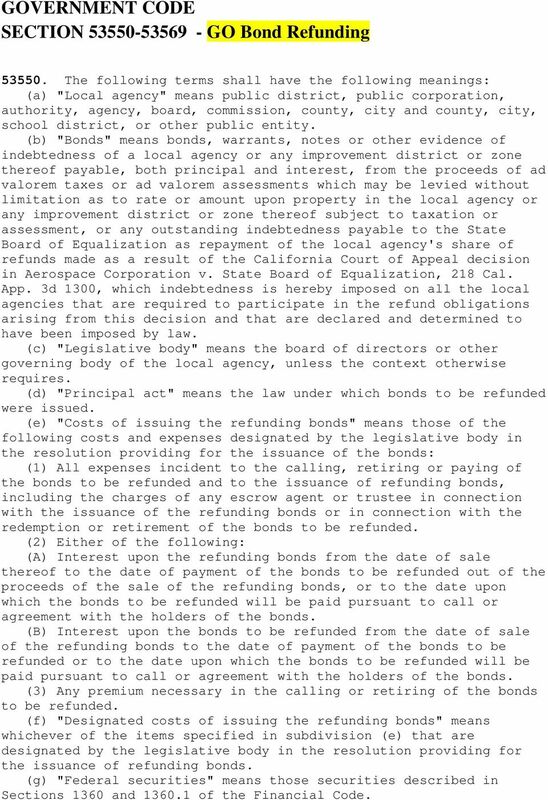 (2) Either of the following: (A) Interest upon the refunding bonds from the date of sale thereof to the date of payment of the bonds to be refunded out of the proceeds of the sale of the refunding bonds, or to the date upon which the bonds to be refunded will be paid pursuant to call or agreement with the holders of the bonds. (B) Interest upon the bonds to be refunded from the date of sale of the refunding bonds to the date of payment of the bonds to be refunded or to the date upon which the bonds to be refunded will be paid pursuant to call or agreement with the holders of the bonds. (3) Any premium necessary in the calling or retiring of the bonds to be refunded. (f) "Designated costs of issuing the refunding bonds" means whichever of the items specified in subdivision (e) that are designated by the legislative body in the resolution providing for the issuance of refunding bonds. (g) "Federal securities" means those securities described in Sections 1360 and of the Financial Code. 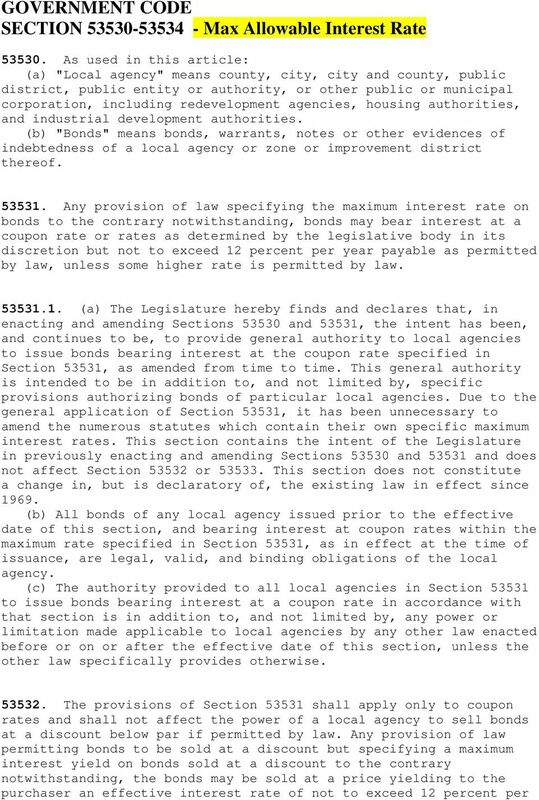 12 The legislative body of any local agency may issue negotiable coupon bonds, to be denominated refunding bonds, for the purpose of refunding any of the indebtedness of the local agency evidence by bonds, whether due or not due, or which has or may hereafter become payable at the option of such local agency or by consent of the bondholders, or by any lawful means, whether such indebtedness, evidenced by bonds be now existing or may hereafter be created, and there shall not be moneys in a special fund in the treasury of such local agency irrevocably pledged to the payment or redemption of all such bonds; but the amount of such refunding bonds to be issued under the provisions of this article shall first be determined by such legislative body by resolution entered upon the minutes of such legislative body Whenever the legislative body of a local agency determines that prudent management of the fiscal affairs of the local agency requires that it issue refunding bonds under the provisions of this article, it may do so without submitting the question of the issuance of the refunding bonds to a vote of the qualified electors of the local agency, unless the legislative body determines to submit the question to a vote, in which case the election shall be held in accordance with the principal act pursuant to which the bonds to be refunded were issued. Refunding bonds shall not be issued if the total net interest cost to maturity on the refunding bonds plus the principal amount of the refunding bonds exceeds the total net interest cost to maturity on the bonds to be refunded plus the principal amount of the bonds to be refunded, provided that this limitation shall not apply to bonds issued to refund indebtedness imposed by subdivision (b) of Section as a result of the court decision in Aerospace Corporation v. State Board of Equalization, 218 Cal. App. 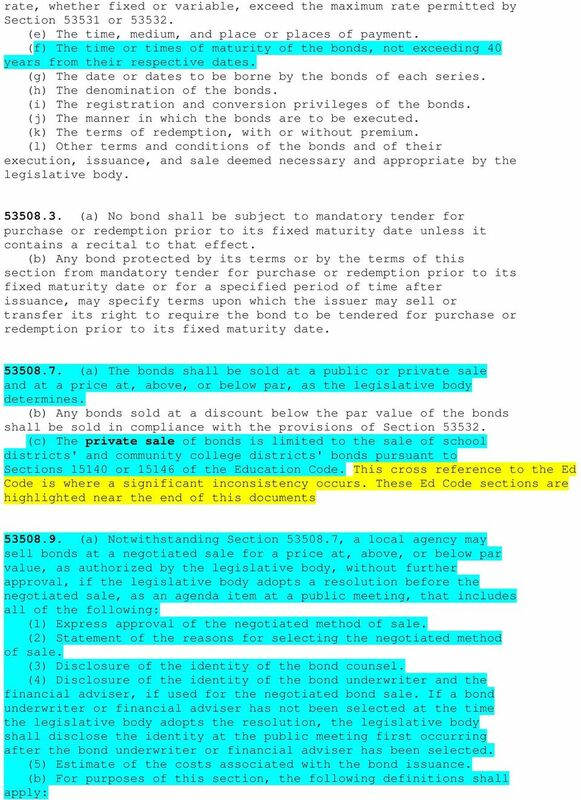 3d Subject to this limitation, the principal amount of the refunding bonds may be more than, less than, or the same as the principal amount of the bonds to be refunded When the legislative body determines to issue refunding bonds pursuant to this article, it shall adopt a resolution providing for the issuance of such bonds. Such resolution shall: (a) Describe the bonds being refunded; and the date on which it is anticipated that the exchange, purchase or call and redemption necessary to effect the refunding shall occur; (b) Fix the date of such refunding bonds; (c) Designate the denomination or denominations thereof; (d) Fix the rate or rates of interest to be borne by such refunding bonds, which rate or rates shall not exceed 8 percent per annum, payable semiannually, except that interest for the first year from date of issuance may be payable at the end of said year; (e) Fix the maturity dates of such refunding bonds, which shall not exceed 40 years from the date of such refunding bonds, or the latest maturity date of the bonds being refunded, whichever occurs earlier; (f) Designate the place or places of payment of both principal and interest; (g) Prescribe the form of such refunding bonds; and (h) State the designated costs of issuing the refunding bonds. 15 Section the refunding bonds shall constitute indebtedness of the local agency issuing such bonds and shall be included in any computation of general obligation indebtedness of such local agency for purposes of any debt limitation applicable to bonds of such local agency under the principal act or for any other lawful purpose, but the bonds to be refunded shall no longer be considered outstanding in any computation of the general obligation indebtedness of such local agency; (ii) If the local agency has met the test of subdivision (b) Section then such refunding bonds shall, until the date on which the refunding bonds are no longer outstanding, constitute a special obligation of the local agency issuing such bonds and shall not be included in any computation of general obligation indebtedness of such local agency for any purpose, and the bonds to be refunded shall be considered outstanding in any computation of the general obligation bonded indebtedness of such local agency; but from and after the date on which the refunded bonds are no longer outstanding the refunding bonds shall constitute indebtedness of the local agency issuing such bonds and shall be included in any computation of general obligation indebtedness It is hereby declared that it is a public purpose for a local agency to issue refunding bonds for the purposes set forth in this article and to invest and reinvest the proceeds thereof, and any other funds legally available therefor, for the purposes set forth herein; provided, however, that it is the intent of this article, and this article shall be so construed, that in no single fiscal year shall a tax be levied or shall funds of a local agency other than those expressly permitted herein be used to pay the principal of and interest and redemption premium, if any, on both the refunding bonds and on the bonds to be refunded The powers conferred by this article are in addition and supplemental to, and not in substitution for, and the limitations imposed by this article shall not affect the powers conferred by, any other law Before selling any refunding bonds subject to the provisions of this article, any local agency shall advertise such bonds for sale at public sale and shall invite sealed bids therefor by publication of a notice once at least 10 days before the date of such public sale in a newspaper of general circulation circulated within the boundaries of each local agency to be aided by the public project to be financed by the issuance of such bonds; provided that, if an issue of bonds is less than five hundred thousand dollars ($500,000), a local agency is not required to advertise such bonds for public sale or to accept bids thereon pursuant to this section. If one or more satisfactory bids are received pursuant to such notice, such bonds shall be awarded to the highest responsible bidder. If no bids are received or if the local agency determines that the bids received are not satisfactory as to price or responsibility of the bidders, the local agency may reject all bids received, if any, and either readvertise or sell such bonds at private sale. 16 GOVERNMENT CODE SECTION Refunding Revenue Bonds The following terms shall have the following meanings: (a) "Local agency" means public district, public corporation, authority, agency, board, commission, county, city and county, city, school district, any other public entity, or any improvement district or zone thereof. 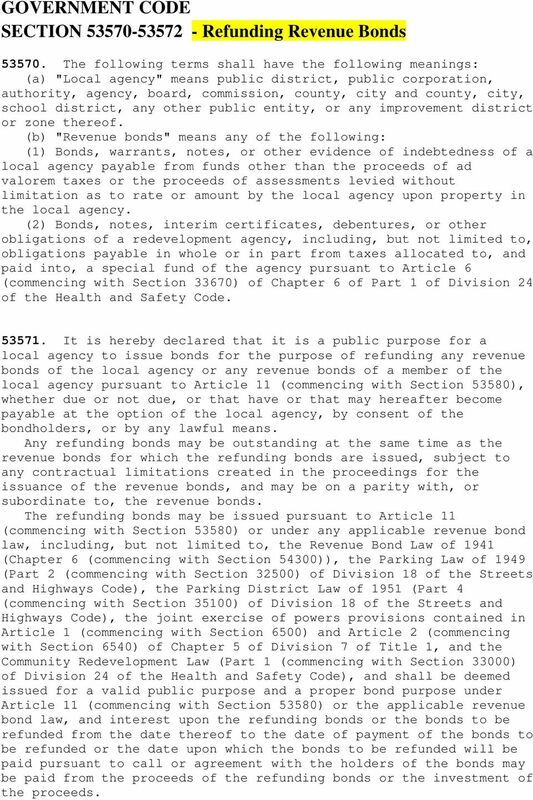 (b) "Revenue bonds" means any of the following: (1) Bonds, warrants, notes, or other evidence of indebtedness of a local agency payable from funds other than the proceeds of ad valorem taxes or the proceeds of assessments levied without limitation as to rate or amount by the local agency upon property in the local agency. 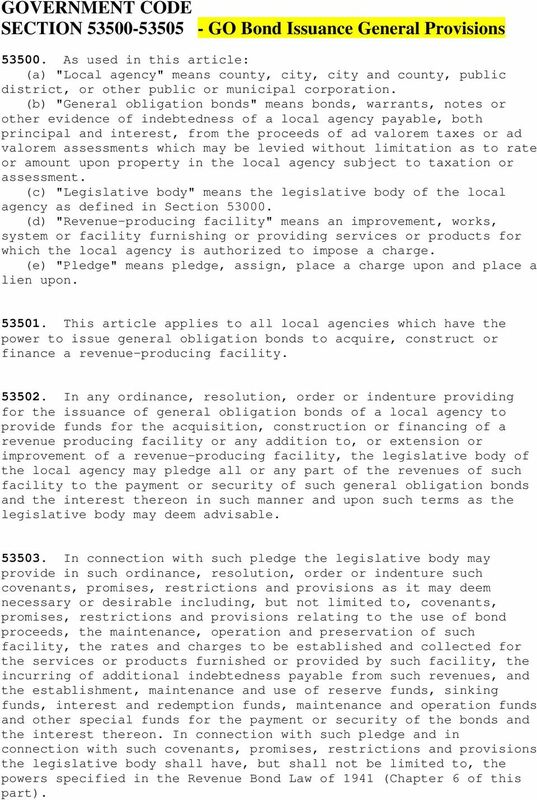 (2) Bonds, notes, interim certificates, debentures, or other obligations of a redevelopment agency, including, but not limited to, obligations payable in whole or in part from taxes allocated to, and paid into, a special fund of the agency pursuant to Article 6 (commencing with Section 33670) of Chapter 6 of Part 1 of Division 24 of the Health and Safety Code It is hereby declared that it is a public purpose for a local agency to issue bonds for the purpose of refunding any revenue bonds of the local agency or any revenue bonds of a member of the local agency pursuant to Article 11 (commencing with Section 53580), whether due or not due, or that have or that may hereafter become payable at the option of the local agency, by consent of the bondholders, or by any lawful means. Any refunding bonds may be outstanding at the same time as the revenue bonds for which the refunding bonds are issued, subject to any contractual limitations created in the proceedings for the issuance of the revenue bonds, and may be on a parity with, or subordinate to, the revenue bonds. 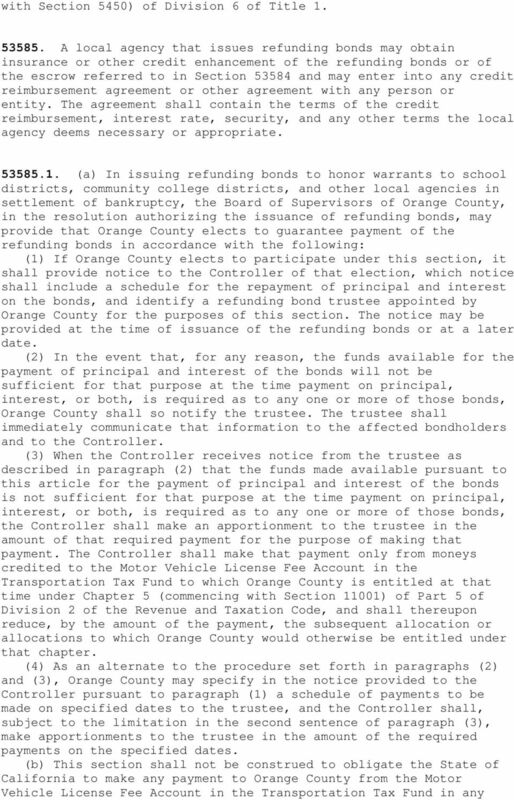 The refunding bonds may be issued pursuant to Article 11 (commencing with Section 53580) or under any applicable revenue bond law, including, but not limited to, the Revenue Bond Law of 1941 (Chapter 6 (commencing with Section 54300)), the Parking Law of 1949 (Part 2 (commencing with Section 32500) of Division 18 of the Streets and Highways Code), the Parking District Law of 1951 (Part 4 (commencing with Section 35100) of Division 18 of the Streets and Highways Code), the joint exercise of powers provisions contained in Article 1 (commencing with Section 6500) and Article 2 (commencing with Section 6540) of Chapter 5 of Division 7 of Title 1, and the Community Redevelopment Law (Part 1 (commencing with Section 33000) of Division 24 of the Health and Safety Code), and shall be deemed issued for a valid public purpose and a proper bond purpose under Article 11 (commencing with Section 53580) or the applicable revenue bond law, and interest upon the refunding bonds or the bonds to be refunded from the date thereof to the date of payment of the bonds to be refunded or the date upon which the bonds to be refunded will be paid pursuant to call or agreement with the holders of the bonds may be paid from the proceeds of the refunding bonds or the investment of the proceeds. 17 In connection with the issuance of bonds under any law permitting the issuance of refunding bonds, a local agency may declare the proceeds of such refunding bonds to be a revenue producing public facility, including an enterprise under the Revenue Bond Law of 1941, or may declare such proceeds to be part of such revenue producing public facility or enterprise or may otherwise declare such proceeds to be held, in whole or in part, and for such time as the local agency may deem advisable, in trust for the protection of holders of the bonds or of the refunding bonds. 18 GOVERNMENT CODE SECTION Refunding JPA Revenue Bonds The following terms shall have the following meanings: (a) The term "local agency" means public district, public corporation, authority, agency, board, commission, county, city and county, city, school district, or other public entity or any improvement district or zone thereof. (b) The term "bonds" as used in this article means: bonds as defined in Section 53550, or revenue bonds as defined in Section (c) The term "refunding bonds" means bonds issued to refund bonds. 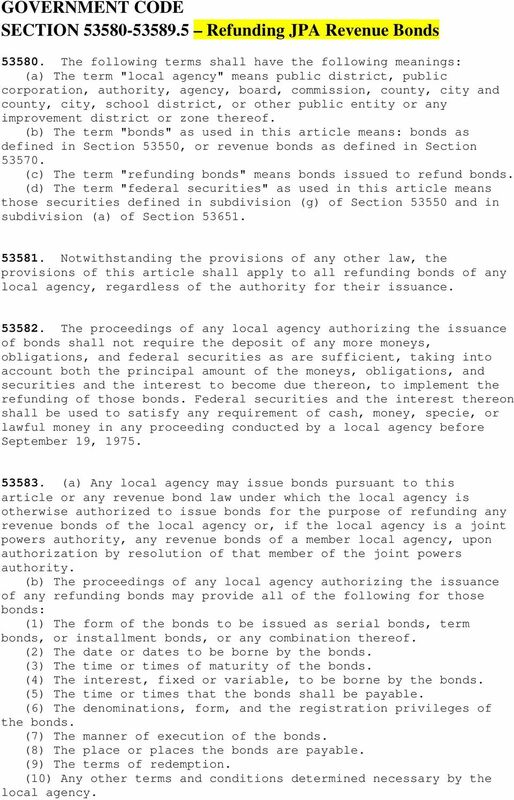 (d) The term "federal securities" as used in this article means those securities defined in subdivision (g) of Section and in subdivision (a) of Section Notwithstanding the provisions of any other law, the provisions of this article shall apply to all refunding bonds of any local agency, regardless of the authority for their issuance The proceedings of any local agency authorizing the issuance of bonds shall not require the deposit of any more moneys, obligations, and federal securities as are sufficient, taking into account both the principal amount of the moneys, obligations, and securities and the interest to become due thereon, to implement the refunding of those bonds. Federal securities and the interest thereon shall be used to satisfy any requirement of cash, money, specie, or lawful money in any proceeding conducted by a local agency before September 19, (a) Any local agency may issue bonds pursuant to this article or any revenue bond law under which the local agency is otherwise authorized to issue bonds for the purpose of refunding any revenue bonds of the local agency or, if the local agency is a joint powers authority, any revenue bonds of a member local agency, upon authorization by resolution of that member of the joint powers authority. 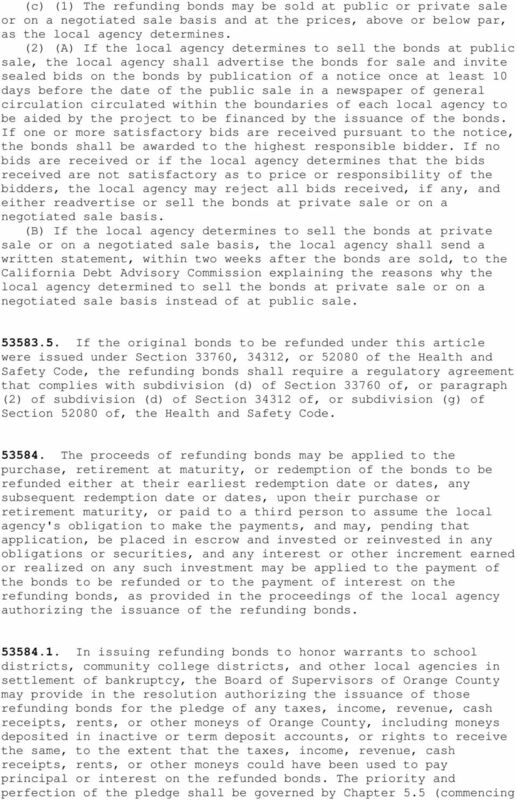 (b) The proceedings of any local agency authorizing the issuance of any refunding bonds may provide all of the following for those bonds: (1) The form of the bonds to be issued as serial bonds, term bonds, or installment bonds, or any combination thereof. (2) The date or dates to be borne by the bonds. (3) The time or times of maturity of the bonds. (4) The interest, fixed or variable, to be borne by the bonds. (5) The time or times that the bonds shall be payable. (6) The denominations, form, and the registration privileges of the bonds. (7) The manner of execution of the bonds. (8) The place or places the bonds are payable. (9) The terms of redemption. (10) Any other terms and conditions determined necessary by the local agency. THE SALE OF REVENUE BONDS ORDINANCE TOWNSHIP OF FRANKENLUST, MICHIGAN ord. no. 71 eff. REGIONAL TRANSPORTATION DISTRICT. (Colorado) Seventeenth Supplemental Sales Tax Revenue Bond Resolution. (Resolution No.